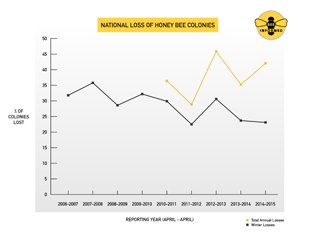 Beekeepers across the United States lost more than 40 percent of their honey bee colonies during the year spanning April 2014 to April 2015, according to the latest results of an annual nationwide survey. While winter loss rates improved slightly compared to last year, summer losses—and consequently, total annual losses—were more severe. Commercial beekeepers were hit particularly hard by the high rate of summer losses, which outstripped winter losses for the first time in five years, stoking concerns over the long-term trend of poor health in honey bee colonies. The survey, which asks both commercial and small-scale beekeepers to track the health and survival rates of their honey bee colonies, is conducted each year by the Bee Informed Partnership in collaboration with the Apiary Inspectors of America, with funding from the U.S. Department of Agriculture (USDA). Survey results for this year and all previous years are publicly available on the Bee Informed website. Beekeepers who responded to the survey lost a total of 42.1 percent of their colonies over the course of the year. Winter loss rates decreased from 23.7 percent last year to 23.1 percent this year, while summer loss rates increased from 19.8 percent to 27.4 percent. Among backyard beekeepers (defined as those who manage fewer than 50 colonies), a clear culprit in losses is the varroa mite, a lethal parasite that can easily spread between colonies. Among commercial beekeepers, the causes of the majority of losses are not as clear. This is the ninth year of the winter loss survey, and the fifth year to include summer and annual losses in addition to winter loss data. 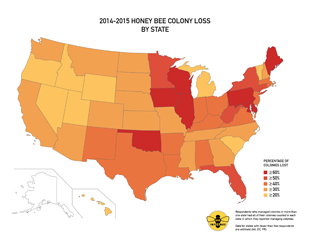 More than 6,000 beekeepers from all 50 states responded to this year’s survey. All told, these beekeepers are responsible for nearly 15 percent of the nation’s estimated 2.74 million managed honey bee colonies. The survey is part of a larger research effort to understand why honey bee colonies are in such poor health, and what can be done to manage the situation. 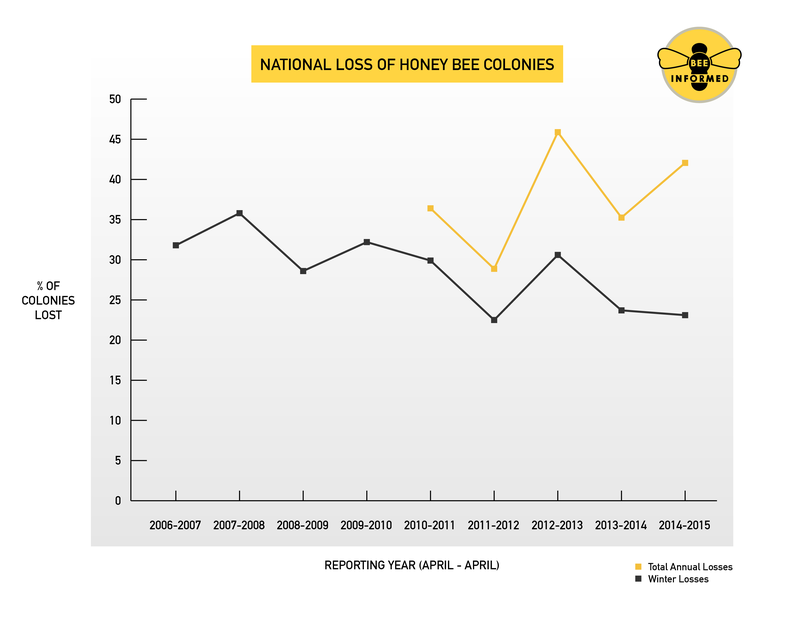 Colony losses present a financial burden for beekeepers, and can lead to shortages among the many crops that depend on honey bees as pollinators. Some crops, such as almonds, depend entirely on honey bees for pollination. Estimates of the total economic value of honey bee pollination services range between $10 billion and $15 billion annually. This survey was conducted by the Bee Informed Partnership, which receives a majority of its funding from the National Institute of Food and Agriculture of the U.S. Department of Agriculture (USDA) (Award No. 2011-67007-20017). The content of this article does not necessarily reflect the views of the USDA. A summary of the 2014-2015 survey results is available on the Bee Informed Partnership’s website.